The article presents three woman figures (Salomea Pilsztynowa <Salomée Halpir>, Ludwika Śniadecka, Jadwiga Zamoyska) who while travelling to Turkey in the 18th and 19th c. not only gained new experience, but also fulfilled – in conformity to their social situation and cultural-historical circumstances – ideal of a peculiar emancipation. Salomea Pilsztynowa wrote in the second half of the 18th c. her memories entitled Proceder podróży i życia mego awantur (My Life’s Travels and Adventures) (published in 1962). Jadwiga Zamoyska is the author of Wspomnienia (Memories) composed between 1893 and 1895 and published in 1961 in Maria Czapska’s preparation. Ludwika Śniadecka is presented in a biography by Maria Czapska which includes rare testimonies: fragments of letters by professor Jędrzej Śniadecki’s daughter. In the polish literature of that time such documents are uncommon as women travelled less often than men, and much rarely did they express recollections in writing. The female memories are thus more valuable in that they deconstruct the then Oriental discourse made by males engaged into political matters and trade. An important trait of the women authors is their national identification which includes elements of historical connections with the East as well as involvement into the current politics. The heroines’ meeting with the Orient means rejection of stereotypes, openness to the other, it enhances cognitive interest and ability of individual thinking. And it is in that way that it leads to the shaping of travelling women subjectivity. The author of the study points at an immense significance of Turkey not only in a literary picture of the world of the most eminent polish romantic poet, Adam Mickiewicz (1798–1855). He grew up in Navahrudak, on the territory of present Belarus, where the Tatars, connected to Turkish and Polish culture, made a strong group, and died during the Crimean War in Istanbul, where he went as a political emissary. Mickiewicz’s picture of Turkey was abundant in ambivalence. It received its full development in his lectures at Collège de France in Paris. He depicted Turkey as a historical enemy with which the Polish Republic waged wars, but also as the only country that, as the historical myth upholds, did not recognise the partitions of Poland. In the poet’s works, especially in their lexis, the influence of Turkish culture is quite marked and, e.g. in clothes and in militaria, significantly affects the Polish nobility. The article attempts to resolve the Indian threads in Juliusz Słowacki’s mystical works. Analysing his output it may be deduced that the poet adapts some elements of Indian thought to the needs of his creation. In Genezis z Ducha (Genesis from the Spirit) and in Dzieje Sofos i Heliona (The History of Sofos and Helion) the metempsychical way of spirit passes through all nations from the Indian beginning, which brings Słowacki closer to Hegel’s conception of the history of mankind. By contrast, in Król-Duch (King Spirit) the Indian past of Slavianism can be noticed. Słowacki showed his interest in the Slavic custom of widow burning, the reflections of which he found in the proto-Slavic culture–Slavic princesses perish on stakes in King Spirit. It may be argued that Słowacki realised Friedrich Schlegel’s great dream and one of the most seminal postulate of Romanticism: he created a new myth, deriving inspiration from India discovered by the Europeans. 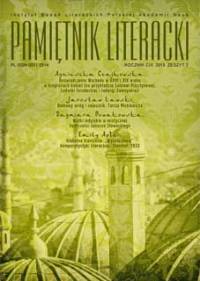 Referring to the attempts made in the last years by various scholars to define comparative studies, Emily Apter in her Global Translatio traces the Istanbul beginnings of comparative literary studies which date back to the 1930s. In the worldwide exchange of ideas that took place there (against the background of mosaic of Eastern and Western languages), she discerns the true germs of transnational humanism or precisely–global translatio. Sketching the picture of the then Istanbul as a city which attracted scholars from all over Europe and showing the powerful influence over the Turkish students and lecturers of, inter alia, an Austrian Romanist Leo Spitzer, employed at the Faculty of Literature of Istanbul University from 1933 to 1936, Apter in a sense revises the foundation myth of exile developed by Erich Auerbach in the Afterword to Mimesis. In her view, Istanbul at that time was neither a secluded spot nor an intellectual desert, as Auerbach seemed to perceive it. Contrary to that, Apter firmly maintains that considering the fact that Spitzer established a lively school of philology in this city, that he himself studied Turkish and in his papers used numerous languages may markedly influence the present understanding of comparative studies as “worlded” minoritarian comparatism. Arguing that the early comparative literary studies were globalised from their outset, she warns against forgetting such sources of literary thought on the now arising global market of culture. In Count Jan Potocki’s biography we find a period of his longer stay on Malta. Unfortunately, he left us neither a description of the island at that time, nor one of the Order of Malta to which he was finally admitted. Potocki’s knowledge on Malta and the reality he experienced are confirmed only by the members of the Order featuring in Rękopis znaleziony w Saragossie (The Manuscript Found in Saragossa) and their remarks about the life in the Order. However, accounts of travellers (e.g. of the Briton Patrick Brydone) from Potocki’s times mike it possible to reconstruct the then island and the Order of Malta. The essay is an attempt at presenting Malta, its inhabitants and the Knights at the time Potocki stayed there. Among the many Polish travellers who visited Egypt in the 19th century, Juliusz Słowacki deserves special attention. He stayed in Egypt from October 20th, 1836, to the end of that year. Słowacki’s companion in the travel was Zbigniew Brzozowski, and also, though separately, two brothers and their friends Stefan and Aleksander Hołyński made a trip to that country. All of them, with the exception of the émigré poet, were wealthy landowners. Słowacki visited Alexandria and Cairo, saw the inside of the Pyramid of Cheops and climbed up its top, as well as up the Nile reached the island of Philae in the South. On his way he took great pleasure in the ruins of temples and pharaohs’ tombs. He opposed the profanation of tombs and robbery of Egyptian antiquities done by European art collectors and their agents. An effect of Słowacki’s travel were poetic reflections about the history of Egypt and the monuments of Egypt. The reflections surpass the “Egyptian” pieces by Western poets contemporary to Słowacki, not excluding Ozymandias by Shelley who, after all, never went to Egypt. Słowacki’s notebook from his travel to the East, containing images, notes and poems, has recently been found. A part of Krasiński Library collection, for many years considered as destroyed during the war, the notebook, following many war vicissitudes, reached a library in Moscow and is presently a subject of editorial activities performed by Polish specialists within the framework of the project sponsored by the Polish National Centre for Science (grant nr. NCN 2014/15/B/H52/01360) and directed by professor Maria Kalinowska. The author of the paper sketches a profile of a Polish comparative studies professor, emphasising the period of his creativity in the Czech Republic as a researcher of Polish-Czech literary relationship and reception of Polish literature in the Czech Republic. She also tries to explain Szyjkowski’s opus magnum reception history, the first part of which (Polská účast v českém národním obrození <Polish Participation in the Czech National Revival>, vol. 1–3) met with positive reception, while the second trilogy, referring to the former and concerning the role of the Polish Romanticism in the Czech spiritual life (Adam Mickiewicz v Čechách <Adam Mickiewicz in the Czech Republic>, Zikmund Krasiński v české literatuře <Zygmunt Krasiński in Czech Literature>, and Juliusz Słowacki w Czechach <Juliusz Słowacki in the Czech Republic>) still remains typewritten and is presumably unknown since it is unmentioned by the contemporary Czech romanticity (romantično) researchers. Henryk Sienkiewicz’s novel Quo vadis translated by Hong Nan-Pa published in parts in the press in 1920 (book publication in 1921) had a considerable influence on the social life in Korea. The Korean society of the 1920s showed much interest in Western civilisation and its modern values. At that time many works of Western literature appeared in Korean translation, but due to the political situation censorship interferences were observed (as, for example in the press publication of Quo vadis). Hong Nan-Pa started translating Quo vadis both on account of his patriotic allegory, and due to a developed love affair thread present in the book. For those reasons the novel reached the taste of Korean society in which on the one hand, anti-colonial atmosphere prevailed, while on the other hand cultural and moral changes connected with so-called discourse on love were taking place. The article presents the correspondence of David Lazer and Jan Parandowski with David Ben Gurion about a Hebrew translation of Jan Parandowski’s Mythology. The authors of the letters are joined by their fondness of antiquity, Hellenic literature and the Greek language. Publication of source materials is preceded by a description of biographical data of the figures involved in the exchange of letters. Especially detailed presentation is given to David Lazer, the translator, a son of Simon Menahem Laser (an editor of “Ha-Micpe”). His life close to his father’s professional matters introduced David Lazer into the circle of eminent Jewish intellectuals of the turn of 19th and 20th c. The paper presents the connections of David Lazer with Shmuel Yosef Agnon, Hayim Nahman Bialik, Nahum Sokolow, Uri Zvi Greenberg, or Marc Chagall. Polish books reached Palestine with the subsequent waves of emigrants from the territory of Poland, though the revival of the Hebrew language and the forming of Jewish country propelled to the development of its own literature supplemented with translations from vernaculars. Inclusion of Mythology into the reading list in Hebrew was supported by the need to experience old great civilisations, the translator’s Hellenistic interest, as well as by commercial reasons. The number of reprints and scale of editions of Mythology in Poland and a great proportion of Poles in Israel ensured wide readership and financial success of the translation. The events presented in the article connected with the edition of Mythology offer the reader an insight into broadly understood problems of Polish literature in Israel and show a picture of Jewish society turning into Hebrew culture. The review analyses Natalia Yakovenko’s book on literary-theological legacy of a Ukrainian writer Ioanikiy Galatovsky (died 1688). As based on the book, Yakovenko studies the shaping of intellectual space of the 17th c. Kiev metropolis and the specificity of Ukrainian religious culture in the early modern period. The review discusses a new edition of Zygmunt Krasiński’s works prepared under Mirosław Strzyżewski’s supervision which comprises 8 books (in 12 volumes). It is the first from a few dozen of years complete publication of the eminent romantic poet’s output of popular science character offering new editorial and interpretive proposals made at the moment when the poet’s handwritings have been lost. The authors of editorial preparation also suggest a different, in comparison to the previous ones, arrangement of Krasiński’s productivity. The works presented to readership are referred to as “Krasiński for reading” which points at the projected reading method from the perspective of a contemporary receiver. The review paper sets the newest publication of Krasiński’s works in the context of its formed editions and supports detailed critical descriptions of editorial solutions included into the individual volumes in this collection. Georomanticism is a collection of studies on the connections between Romantic literature and broadly understood space. The new approach to the issues that have been raised many times unfolds in recognising the cultural perspective as overriding, since this perspective opens the field of research in identity problems (connected e.g. with political and civilizational changes), in confrontation of various spatial orders (consideration on common/arguable/separate places) or spatial imagery, as well as in the “avant-garde” role of Romanticism for such fields of new humanities as politics of place, ecocriticism, and open or comparative regionalism. A separate value of the collection is its polyphony displaying in a variety of approaches and diversity of applied methods and discourses to which the volume refers. The review contains a discussion on Kajetan Mojsak’s book Groteska w polskiej prozie narracyjnej 1945–1968 (Grotesque in Polish narrative prose 1945–1968) against a broader background of Polish and world subject matter and the changes of the grotesque in literature of the last half-century. The text is a remembrance about professor Stanisław Jaworski (died February 15th, 2018), a distinguished literary theoretician and literary historian, a long-time employee at Jagiellonian University, Faculty of Polish Studies, and “Ruch Literacki” (“Literary Movement”) editorial staff member and editor-in-chief.